I had a fascinating day in Libya yesterday, witnessing the tragic collapse of this country, where the rule of law effectively disappeared six years ago, but has descended into chaos since 2014. It is hard to believe that this is a country that, until recently, was one of the wealthiest in Africa, thanks to its massive oil revenues. The lack of infrastructure and dangers posed by rival militia groups was evident. Only a couple of weeks ago, the airport I arrived in had been hit by artillery shells, damaging the arrivals hall and a Libyan Airlines aircraft. The main airport in Tripoli was completely destroyed three years ago. And, just last week, 11 were killed at the electoral commission as it began to prepare for this year’s vote. I was struck by many things but, more than any other, I couldn’t understand why, in an oil producing country, most petrol stations were shut, and why those that were open had queues going on for hours. I knew there was fuel smuggling but had no idea it was on such an endemic scale. Financially, it costs the economy over $750 million per annum. But the impact of fuel smuggling is destroying the very fabric of the country. 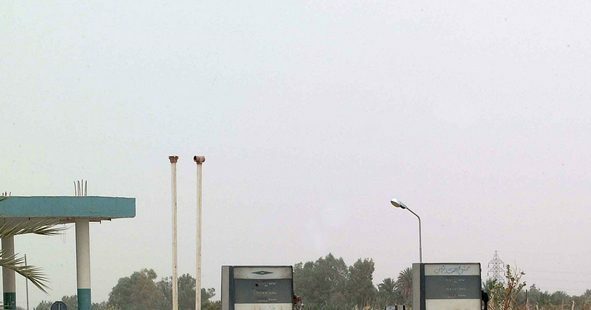 The smugglers and thieves have permeated not only the militias which control much of Libya, but also some fuel distribution companies which are supposed to bring cheap fuel to Libyan citizens. The huge sums of money available from smuggling have corrupted parts of Libyan society. It is nearly impossible to understand how such widespread theft of oil could take place and how it is taken out of the country and sold internationally. Which took me back to my visit to Malta three weeks ago, where I had read how its authorities had failed to act to prevent an oil smuggling ring sneaking fuel out of Libya into Malta. This was despite the fact that the ringleaders had been arrested by Italian police and Libyan authorities. This is being investigated in Malta by The Daphne Project, which was created several months ago, after Maltese journalist Daphne Caruana Galizia was killed by a car bomb outside her home. A group of 45 journalists representing 18 news organizations from 15 countries picked up the investigative work of the murdered journalist. The project’s reporters have focused on the oil and fuel smuggling from Libya, in which a former Maltese football star, Darren Debono, and a Libyan militia chief, Fahmi Ben Khalifa, teamed up and enlisted a man connected to one of the families of the Cosa Nostra mafia clan in Sicily to help them create the oil smuggling business that raked in millions of euros in sales. After the toppling of Colonel Gaddafi in 2011 and the civil unrest that ensued, Libyan refineries fell to various militias – including one in Zawiya, which Italian police say came under Ben Khalifa’s control. Instead of defending the refinery, the militia stole diesel from it, and smuggled it out of Libya to sell it illegally in Mediterranean countries, including Malta, Italy, Spain, and Turkey. It’s not clear how much total profits the smugglers made, but according to Italian authorities, the smuggling ring made at least $30.8 million selling fuel to just one Italian buyer. According to the Daphne Project’s sources in Maltese fishing cooperatives, Malta’s authorities were leaving fuel ship-to-ship transfers undisturbed, and even allowed the vessels to dock at bunkering facilities without being checked by the coast guard. Ben Khalifa has been in custody in Libya since August last year, while Italian authorities arrested Darren Debono in October. Nevertheless, oil smuggling has not stopped. And until EU member states, like Malta, stop this criminal activity, it is hard to see how Libya can restore its wealth, or its dignity, or the wish of its people to just see this sad war end.